Are you buzzing with BuzzSumo? I don’t know what that means, but what I do know is that BuzzSumo is a very valuable tool to have in your social media toolbox. In this article, we talk about buzzing with BuzzSumo… eh actually no! We talk about the super features it has as a tool. So hang on in there and enjoy the ride. You’ll be glad you did! Track competitors and do an analysis based on their content. If you want to know how to use BuzzSumo to get the most value out of it, here are some practical examples. Trying to come up with an idea for a piece of content is like sitting down with a blank piece of paper and not knowing what to write. It’s annoying, frustrating and time consuming. And… when you do write that piece of content, it can be hit and miss. Sometimes, you get lots of shares and links and end up ranking for content and sometimes the content goes nowhere; you get very few shares and no traffic from Google. It happens to us all and it’s impossible to guarantee success, but the frequency of this happening will be substantially reduced if you use BuzzSumo. Before you head over to BuzzSumo, go to Google Keyword Planner and do some keyword research. Enter in the keywords that you are thinking of writing content about and find out how many people are searching for those keywords. If these keywords don’t work, Google will show you related keywords so hopefully you’ll be able to find alternative options. Imagine if the article you wanted to write about was ‘social media monitoring tools’. In the image above, you see that the average monthly searches for that phrase is 480. Although that may not seem that high, there are going to be a lot of similar keyword searches that you could also rank for. Now you have an interesting group of keywords but you’re not sure if you can rank for them on Google. So, you might do a quick search on Google to see who else appears in the search results. When we are doing research like this, we have a tool called ‘Moz toolbar’ installed on our browser. When this is installed, you will see the Domain/Page Authority for each of the Google results. The Domain Authority shows how important Google thinks that the website is. If your Domain Authority is 25 and you see that all the results on page one have content matching the keywords and their Domain Authority is really high, then your chances of ranking in search results are low. In the following image, there are some results that are not that high (relative to my domain) so there’s a good chance of ranking for this. Now, you head over to BuzzSumo and do a search for these keywords. You want to find out what is the most shared content related to these keywords. Once you know the most shared content related to these keywords, you want to write a piece of content that is better, for example, more up to date and more detailed. Then, at least, you have a chance of beating competitors in the search results if you do significant promotion. Brian Deane introduced a term called the skyscraper technique, which describes this process in more detail. Now that you have great content that people are looking for, and you know people like to share it, it’s time to go out and promote it! Example: Seer Interactive Finds Content to Write about Obama Healthcare!! Seer Interactive, a digital-marketing agency, is another client that uses BuzzSumo for coming up with content ideas. One of their recent client projects involved writing an article about health care, specifically Obamacare. They were stuck on content ideas, so they fired up BuzzSumo, and searched for “healthcare OR Obamacare”. Based on the results that showed the most-shared content, they could see that consumers wanted unbiased information that taught them what Obamacare meant. But, it also helped uncover hidden gems such as this article on how wearable technology could decrease the cost of healthcare. These hidden gems would’ve been almost impossible to find through a traditional Google search or even Twitter. With a simple BuzzSumo search, the Seer Interactive team developed a bunch of content ideas they could explore, discuss with their client, and write about. I was looking for something to share on Facebook and was looking for content that was popular. So, what’s the best way of finding it? Go to BuzzSumo and type in a topic related to your business. Sort the list based on the most Facebook shares. Now, you have content related to your topic that is popular on Facebook! This is what Laura Elizabeth Mann of The Hodges Partnership (a PR and communications firm) uses BuzzSumo for. Part of her job involves creating a social-media calendar of content to share. Last year, she was searching for content to post related to Andrew McDonnell (a huge news story in the US in 2014). With a simple BuzzSumo search, she was able to find a few articles with over 20,000 social shares. This gave her social proof that suggested her followers would most likely find them interesting as well. If you create great content, you need to promote it, too. Social media is a great way of promoting content but you need to reach the right people. 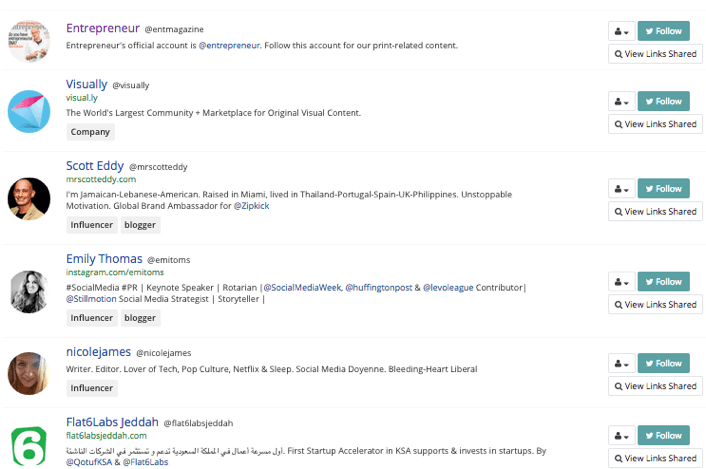 If you find content that’s similar to what you have created, BuzzSumo shows you the most influential people on Twitter who shared out that content. If they shared similar content, it’s worth reaching out to tell them about your content. Social media is a great way of getting your content known and shared but, if you want to rank for the keywords you are targeting, you normally need to build up links from high-profile, relevant sites. But, which sites do you reach out to get links? That was one of the main problems faced by Richard Moynihan, Social Media Editor at The Telegraph, who was involved in Project Babb, a sports-centric site. Richard and his team used BuzzSumo to target people whose audience they wanted to access. They compiled an outreach list of sports influencers they could work with (to co-create content), as well as people who could share it with their followers. Project Babb turned out to be a huge success, thanks to BuzzSumo Influencers search. You don’t need to be a publisher to use this feature. If you’re building a new product, and you want to attract attention, you also would find BuzzSumo’s Influencer Search useful. Jimi Smoot, an entrepreneur, was involved in building ShareWalla in 2014, a tool that requires readers to tweet a link before they’re allowed access to content. He built the product in six weeks and launched it to the public, but only a handful of users signed up. In order to build awareness, he decided to reach out to the growth-hacking community (since his product was related to that niche). To do so, he did a BuzzSumo search, looking for influencers related to growth hacking. He looked at engagement metrics such as average retweets, Page Authority, and reply ratio to compile a huge list of people to reach out to via Twitter and email. Using this technique, along with others, he eventually drove 10,000 visitors to ShareWalla in August of 2014. Find content in your niche that gets a lot of shares and find out who the author who is (this is listed in the results displayed by BuzzSumo). You can then reach out to the authors to see if they’ll write for you on your site. BuzzSumo has even created a search specifically for finding great authors. “Use a tool like BuzzSumo. 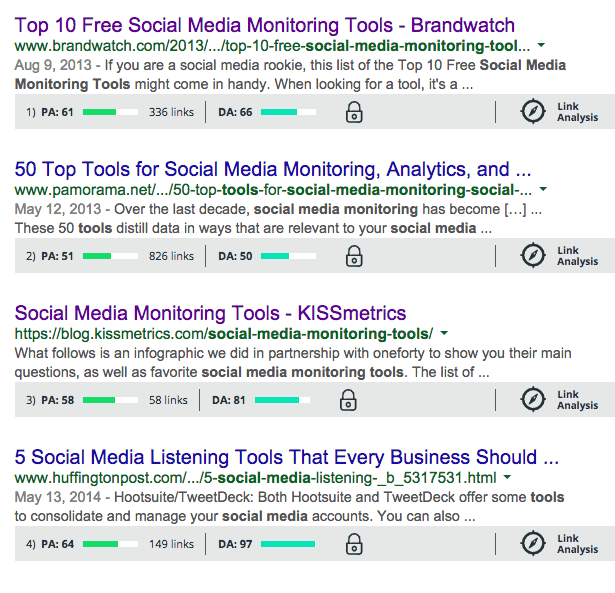 Search for your topic and niche and note the writers that are consistently getting high social shares. Many times these people will write for larger publications like Huffington Post, Entrepreneur and appear regularly on influential niche sites like MOZ. “If you hit up 5 or 10 of these type of people you will usually get several to say yes. However, skip the CEO types (They are probably Ghost Writing anyway). 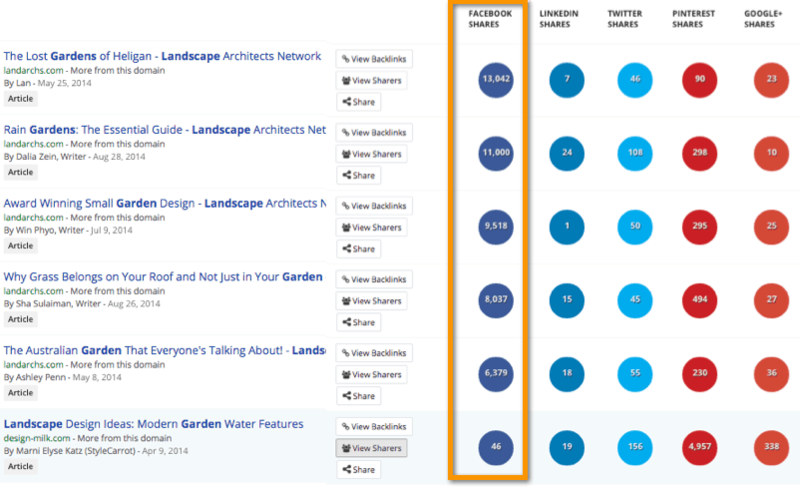 AJ Ghergich, of Ghergich & Co.
BuzzSumo doesn’t only show you the most-shared content for a topic. It can also show you the top-performing content for your domain or, even better, your competitor’s domain. Channels that get the most shares. This is amazing research and you should do it on your top competitors. One of the Pro features of BuzzSumo is their content alerts. We set up content alerts for our brand name and my name, too! You could also set up content alerts for competitors. What I have found is that these alerts are far more comprehensive than other alert applications and they arrive very quickly after the link appears (e.g. sometimes in under an hour). But you can also use alerts for content ideas, by keeping tabs on what’s “hot” in your industry. With this data, you can create content that’s always up to date with what’s happening right now. “I had one case where a well-regarded competitor published a controversial article. A BuzzSumo alert tagged it in the evening, and we had created a rebuttal and had it on the desk of our client’s Marketing Manager, ready to publish, by 8 am the next morning. Client for life on that one. 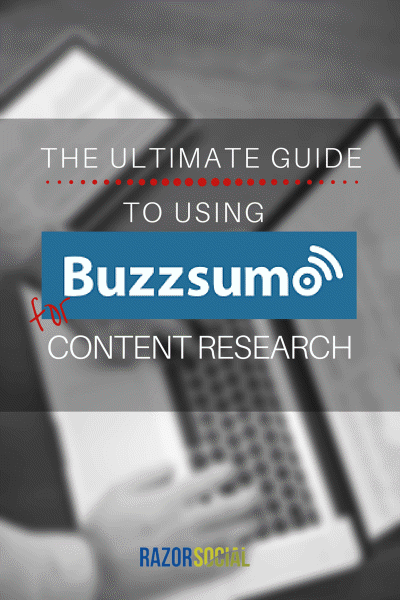 BuzzSumo is an extremely useful content-research tool with some incredibly powerful functionality. I hope that this article showed you how to use BuzzSumo effectively and that you’ll at least test it out using the free version. What do you think? Have you used BuzzSumo before? Do you want to share any examples of how you used it?